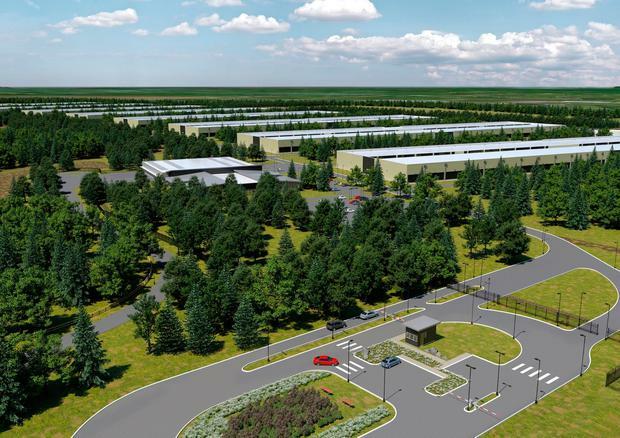 Apple formally pulled the plug on ambitious plans for a giant Athenry data facility, citing a three-year planning delay. The decision to abandon plans for the €850m data centre in Co Galway was greeted with devastation locally. The IDA said it is working with the Government to assess the impact of Apple's decision and to ensure a streamlined planning process is introduced that provides greater certainty for investors. Business representative group Ibec said the case demonstrates Ireland's planning regime is "increasingly seen by potential investors as a bureaucratic black hole". Apple employs more than 6,000 people in Cork and is currently transferring €13bn in back taxes to a State-approved escrow account. Last week, lawyers for two objectors, Sinead Fitzpatrick and Allan Daly, succeeded in an application to have an appeal heard in the High Court over the matter. In granting leave to appeal, the Supreme Court also warned it may have to refer the case to the European Court of Justice on a point of law, which could bring a further lengthy delay to proceedings. In a statement, Apple said that it could no longer wait for planning arguments to play out. "Several years ago we applied to build a data centre at Athenry. Despite our best efforts, delays in the approval process have forced us to make other plans and we will not be able to move forward with the data centre. Business groups and local politicians had hoped to see a multiplier investment effect from the project. "This was to be one of the most significant investments in regional Ireland and the west that we have seen," said IDA chief executive Martin Shanahan. "The delays in achieving a definitive outcome from the planning process have led to where we are today. "It is disappointing albeit unsurprising that the company has concluded that it will no longer engage in the process. "We need a much higher degree of predictability in relation to our planning processes, appropriate for the pace at which the commercial world works." However, Apple moved to distance the decision from any wider relationship considerations with Ireland over tax or other issues, citing new investments in its Cork facility. "In the last two years we've spent over €550m with local companies and, all told, our investment and innovation supports more than 25,000 jobs up and down the country. "We're deeply committed to our employees and customers in Ireland and are expanding our operations in Cork, with a new facility for our talented team there." The data centre would have been one of the largest in Europe, with 300 temporary construction jobs and 50 permanent technical jobs for the site at Derrydonnell Woods. But objectors said appropriate environmental assessments had yet to be completed and the facility might use as much as 6pc of the national grid's electricity output. The decision to scrap the project may not prevent a Supreme Court appeal relating to the saga. The Chief Justice, Mr Justice Frank Clarke, has said a court deliberation on the matter may still go ahead. Those who objected to the data centre say they want their appeal, taken against a High Court decision that gave Apple the go-ahead, to proceed because it involves a point of law around how planning decisions are made by An Bord Pleanála. Mr Justice Clarke has asked for motions to be put before the court, adjourning the matter until the end of May.